I finally have time to take a minute and write about our first day with Selah. First of all I need to tell you how absolutely wonderful Lifeline has been. This process is made so much easier when you know that every detail is taken care of by your in-country staff. Now to tattle on myself......I forgot to bring extra visa photos of me and Jeremy. Totally my fault as it slipped my mind. However, Miko to the rescue. She easily took us down to the small shop and hooked us up with new photos! Now back to our first day. We woke on Monday morning bright and early at 6am. Jeremy and I struggled to get back to sleep. We stayed up until 11:30 Sunday night (after having been up for over 40 hours) but still woke early. We went to breakfast at our beautiful hotel and enjoyed the Christmas music still playing. Good old American Christmas music by Bing Crosby and others. Becca enjoyed her breakfast of waffles, pancakes, watermelon, pastry roll, and cereal. She enjoyed it! I ate some and so did Jeremy. We still had several hours to kill since we were not meeting Selah until after 2pm. Oh the hours dragged on. So Jeremy decided to let Rebecca experience Trust Mart in Guangzhou! That is the same thing as Walmart, right down to the Great Value name brand. And the special Oreos. And the dried whole duck. Or the bulk items that are not all that different. And who could resist a photo with Pleasant Goat? All in the basement of Walmart. We came back from shopping and Becca had some crackers with Nutella for lunch. We opted out! We were not hungry. Our guide met us in the hotel lobby and she had her driver take us to the Civil Affairs office. We were the first and only family there for a while. We did not know but Selah was already there in a separate room. We had to check over documents to make sure they were accurate. Then they brought our daughter out to meet us. It was quite different than when we met Mariah. Selah was very quiet and reserved. She did not hug us and we felt a little resistance when we were told to go ahead and hug her. A couple of photos from our day. We were told how lucky she was to be adopted just three days before aging out. We feel that we are the blessed ones for adopting her. It was all very fast. We didn't sign a single paper there! She left with us and we went to the grocery store to get her a few things she liked. She had a lot of trouble trying to decide on something. She finally found some noodles and I recommended some fruit. Our guide asked her what she wanted for supper and finally the guide talked her into pizza. So, we walked to Pizza Hut for supper. This was Selah's first taste of pizza! She seemed to enjoy it! She is starting to enjoy Rebecca. Many games of UNO were played with all four of us. It was funny that when Selah laid down a Draw +2 it should have been Rebecca to draw the extra cards. Selah laid her hand on the deck and wanted Jeremy to Draw +2! We all chuckled. She gets her Baba! He is a jokester and she can hand it right back. We have noticed that Selah has decided not to use chopsticks. It is interesting because she has no idea how to use silverware. She tried many times today to try to pick up a piece of sausage this morning at breakfast. She did succeed! I tried to help her bring her bowl and plate over to the table for breakfast and she made it clear she would do it herself. Just imagine no one ever being there to help you for 14 years then all of the sudden you have a mom who wants to do this. She will soften with time I am certain. I now have to admit that I am having a tough time keeping my eyes open. I am so tired. The lack of sleep is catching up with me. I have not slept well in many nights. It began several nights before we left. I'm not sure I'll make it to see the new year here in the next five hours. Please pray for our other kids. My Ben is using his nebulizer for breathing treatments. He is coughing terribly if he does not use it. He will be fine, I'm just a momma who worries. Kyle and Micah are doing well. Micah has a cold but is fine. Mariah is doing well. I laugh because my mom told me that she is so funny! When we Skype with the kids Mariah feeds Jeremy, me, and Becca her special pretend cookies. 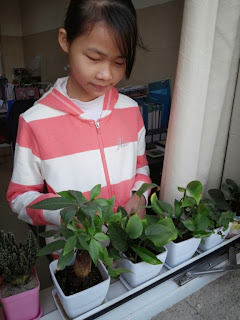 She is enjoying capturing as many stink bugs as possible and watching them in their new "home". We still eleven days here in China. We ask that you pray we all stay healthy. We also pray for our sweet Selah. She has a very long way to go. We are well aware of her struggle and it will be difficult for her as she realizes she has left her friends and everything. She needs time. We will wait forever for her. God has been so good to us and has richly blessed us. What we lack in worldly possessions we have in priceless treasures. If I could begin to explain how exhausted we are I would. We got up on Friday morning around 8am after a very late night before traveling home to Pennsylvania. We were up at 8 and have not been to bed since. Our journey to China began around 2pm Friday as my brother and dad drove us to Pittsburgh International Airport to catch our first flight scheduled to leave at 7pm. My passport was flagged in the system and caused a minor delay as we explained to the ticketing agent that we did in fact have return flights. I guess since they are on a different airline it flagged my passport/visa. I cannot explain why it did not flag Jeremy's or Rebecca's. Becca loved her first flight. The flight attendants were so sweet with her and made a big deal over this being her first flight. We made it to Atlanta and had our first layover. We boarded our flight on Korean Air around 12:30am and took off right at 1am. We were amazed at the service on Korean Air. We liked United our last time but, WOW! Korean Air was unbelievably accommodating and professional. Every single aspect was taken into consideration. We each had slippers, moist towels, a toothbrush and paste, orange juice and pineapple juice whenever we wanted, bottled water, two full hot meals, and snacks of peanuts, brownies, more peanuts, and hot tea. But a fifteen hour flight is long regardless of how great an airline. We were a little surprised to find that the entire 15 hour flight was in darkness! We kept waiting for the sun but it never came. We landed in Seoul about 20 minutes late at 6:20am and were very surprised to find that we had to go through security again. Other American families said they had never been through such terrible lines there in Incheon before. It took almost 2 hours there. I went through the metal detector and it went off. This caused me to be pulled aside and a female police officer did a strikingly personal pat-down! I was free to go. We only had about 15 minutes before boarding our last flight to Guangzhou. We loved this flight even more. Our seats had better reclining positions and more room between the seats. Again, it was Korean Air. I am happy that we are returning to the States using them as well. I found it quite odd and I don't know why it sort of surprised me but we obviously could not fly through North Korean air space. So we flew around. We landed in Guangzhou and proceeded to baggage claim then met our guide from Lifeline. Miko was also our guide for our last visit to China. Becca had her first experience with riding as a passenger in China's crazy traffic! We were pleasantly surprised to see an absolutely beautiful Christmas tree in the grand lobby of our hotel. We checked-in to the beautiful Garden Hotel and brought our weary bodies up to our room. Miko stayed and helped us get our paperwork ready and gave us our schedule for the next two weeks. I have to admit that we were so tired I hope we didn't miss anything. We meet our daughter tomorrow afternoon. We meet with our guide in the lobby of our hotel at 2pm and we proceed to the civil affairs office from there. We will take Selah's new backpack that we have along with some goodies that we plan to give. Since we are one of two families here for our Gotcha Day tomorrow, we are unsure of all of the details of the week. We are Lifeline's only family. I'm not sure who the other family is with. We have seen some very unique Christmas decorations! I'll be sure to get some photos to share. I terribly miss our kids back home. My boys have texted us several times telling us how much they miss us. Mariah keeps asking my mom and dad where Jeremy and I are. Before we left, Mariah knew something was up. She kept coming over to me saying, "I miss you, Mommy!" We hadn't even left yet. This is the part I hate about coming. I miss my kids!! We both do. I read a great verse today as I was reading my Bible on the plane. I would like to share as it touched my heart because I was just thinking how much I love God. This Saturday we finally received our long awaited furniture for the older girls' bedroom. Rebecca and I quickly made the beds with the newly washed bedding. She was so excited to finally get her new room. We moved all of the girls clothes over form Rebecca's old room and most of the boys clothes are moved to their newly finished room in the basement. This furniture has caused us such a headache. This is the second set of furniture and the second store. To be honest if we were not desperate for the girls' room to be done before we leave we would have returned this set as well. We have never experienced such terrible customer service. We just wanted to know when it would be delivered and one simple question and persistence from us (due to our schedule and trip) they were terrible. Jeremy even made the trip down to the store to speak with the store manager and they refused to let him see the manager. On the bright side the delivery guys were super nice and did not damage anything. We took a quick trip to Pittsburgh on Thursday to take Ben and Mariah to their endocrinologist. Mariah hates socks and shoes on her feet. If you look closely you'll see her socks on her hands. Why not? Just relaxing watching some Micky Mouse on the iPad while we wait for the doctor. 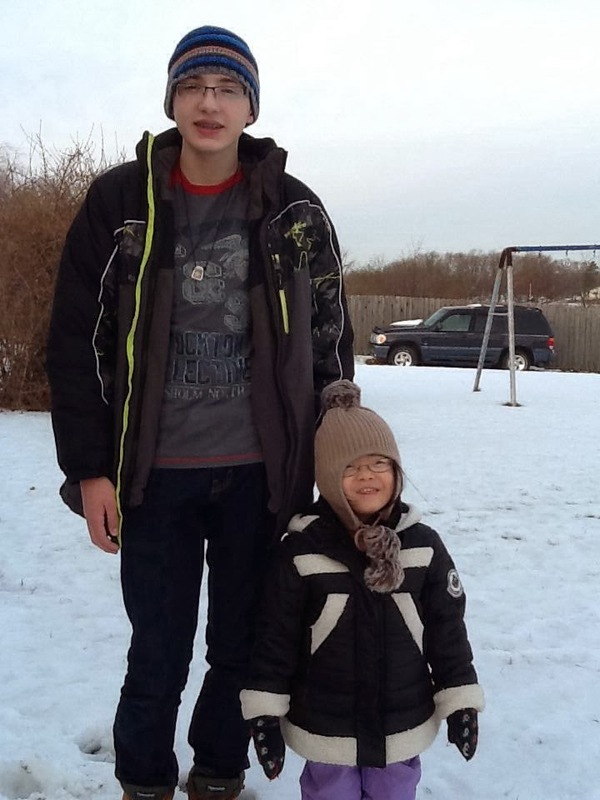 Then we went to my mom's to get the other kids and of course, they had to go play in the snow. We opened Christmas gifts at my parent's too. We figured that since our van will be pretty full on our return from China it was smart to go ahead and open those now. This is how Mariah felt about it! Grandma and Pap bought Mariah her Bity Baby twins. She (with a little help from us) have named the babies "Mollie" and "Matthew". When we asked her to name the little girl it almost sounded like "Mollie" so it stuck! The older kids had been outside playing all day. So they look a little unkept! Since we left the house before 6am we forgot our camera. This photos are taken with my mediocre phone. We are not done wrapping gifts yet. But we will get there. While I was wrapping gifts Jeremy was cleaning up his tools from the boys' new bedroom. We stayed up way too late! I'm disappointed to miss the kids' Christmas programs tonight. Mariah was supposed to sing with the toddlers and Becca and Ben are in the older kids' program. Yesterday Mariah woke up from her nap with a fever. She was up a few times during the night and still is running a temp today. I guess we will have to watch from web streaming. Looks like next year will be yet another "first" for Mariah. We are wrapping up the last of our planning for China. It is really hard for me to share these details but I've had a few people asking very specific questions about the financial aspect of adoption. I am sure this is a result of our recent fundraiser. So here it is. Our adoption this time around is costing right at $40,000. Honestly, we are a little short right now. We will figure it out in the next few days. I know God will supply where we simply cannot. We are definitely walking by faith at this point. There are two grants that we received that our agency does not have yet. We know for sure one will not make it to our agency on time. The other one we cannot get a hold of anyone to get some answers. We had a family friend send us a card this week and it made me cry. Here is what was written in an email following the Christmas card. This is how God has provided for us this entire short process. Romans 12 gives reasons for giving..you say it is a sacrifice...well, we are to be living sacrifices..I think about Christ sacrificing his life for me because he loves me. Love is a sacrifice...True love is shown by sacrifices one makes..we don't always make sacrifices to the people we love..so just accept the money and pray it arrives so it can help you in bringing Selah home. We love you guys and don't show it often enough. Jas 2:15 If a brother or sister be naked, and destitute of daily food, 16 And one of you say unto them, Depart in peace, be ye warmed and filled; notwithstanding ye give them not those things which are needful to the body; what doth it profit? If we know you have a need and can help meet that need, but instead we say, "Oh we'll pray for you," how would that show our faith? We show our faith by our works. Enough said...just use the money however you need. I had another friend who sent us a check and told us not to thank her but thank God. He had provided for them in mighty ways. Other friends have helped thoughout our adoption. We are so grateful. We simply could not have afforded this on our own. So many families have gifted us financial help. Will you please pray that we can get things done very soon? We talked about weather with her. She is very concerned about us having some warm clothes for her. She also asked if we have central heating. She keeps telling us how terrible her English is. We jokingly told her how we are terrible with Cantonese and Mandarin.....the two languages she knows. She can read some English and what she couldn't we noticed her looking up words in some kind of a book. We are so encouraged at her willingness to learn. We did hear her tell her social worker as she was trying to take over the keyboard, "Let-a me!" We both smiled! We showed her our Christmas tree. She thought it was pretty. 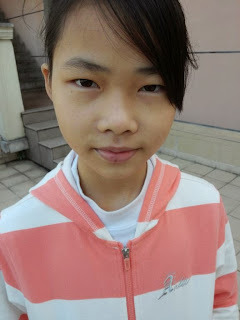 She is living at boarding school during the week and at foster parents on the weekends. It has felt like The Enemy is working overtime to steal our joy and prevent this adoption from happening. Even though the bank's mistake cost us $500 on our flights, and another $120 for our visas, we still choose joy. I just told Jeremy that God must have some amazing things in store for our Selah because Satan has been non-stop in almost every area of our lives. It makes me even more excited! I guess I'll end this post with a strange addition I noticed to Christmas Town......oddly, there are wolves roaming the town. Very large wolves that have a striking resemblance to those seen in the Lego set of The Hobbit. We have boys in our house, can you tell? I am hoping to write at least one more post before Christmas. Until then we are wishing you all a very Merry Christmas!!! Friday was such a special night for us. After looking at still photos for months, we were finally able to see our new daughter live! Here is a screen shot of the beginning of our session. Selah is in the pink. Unfortunately they could not hear us. We could hear them but for some reason they couldn't hear us. This is how the beginning our session began! This is a Chinese website so we were struggling a little with the Chinese characters. Honestly, we were guessing! I easily could have been the spotty internet service there. I know it is common. I was so happy to interact with her. It was pretty clear to us that she was overwhelmed at the beginning. She is very quiet. She is beautiful! We were thrilled that she seemed to be able to read a little English. 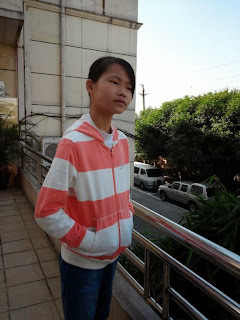 She was not able to speak English but she seamed to be able to read it a little. We asked her questions (through texting online) and she was trying to answer the questions for us. Here is another screen shot and it took a while for her to read and answer our questions. Sometimes we asked the next question before she answered. We asked her if there was anything we could bring her and she answered, "No! No! Don't take things to me." It really kind of broke my heart. She wants nothing from us. Not in a bad way. She probably has not had much of her own so this concept is truly foreign to her. Some of it got lost in translation. Where she wrote, "1 year" was actually her answering how long she has been out of the orphanage in foster care. She misunderstood the question. However, we are thrilled with how it went. She loved seeing the kids. She lit up when she saw a "Chinese sister". God is so wise in how he gave us Mariah first. It is clear to us that having Mariah in our family will make things more comfortable for Selah. 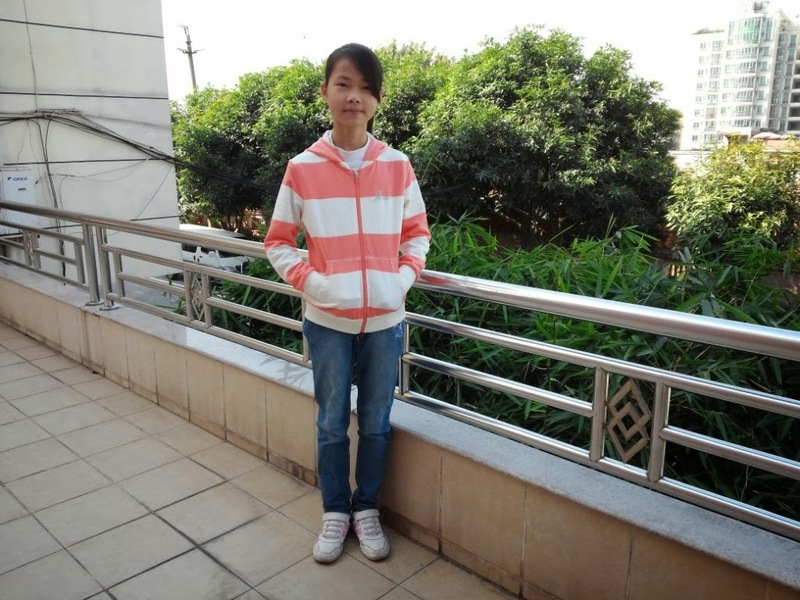 By they way, we will likely be calling her "Hui Yi", her Chinese name, for quite a while. I will not take that away from her. This is pronounced something like "who-i (short i) ee" The Yi has one sound....the long e sound. 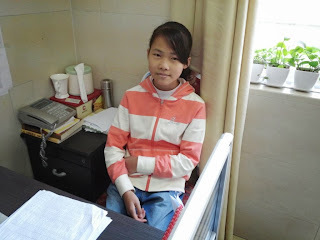 Hui Yi's social worker asked if we could Skype again this week at the same time. We are excited to see her yet again. What an unexpected blessing! Saturday was our Mariah's third birthday! She had such a great day! First was breakfast with Daddy. However, I crashed the party! We had an ice cream cake for her after supper. Since I am a little busy this year......I opted for the easy route and have DQ make the cake. She loved it! This Sunday our children went up to the front and gathered with our pastor. Our younger three are pictured here. Mariah is there but you have to look! Ben raised his hand when our pastor asked what the children wanted for Christmas. His response....."Selah". Oh my! I had a feeling he would say that but you never know. Then our pastor asked Mariah and she finally said, "My Mommy!" Oh my sweet girl! I promise I am here. Then Rebecca kissed Mariah on the head. I am blessed! We had our fundraiser this past week. I am the first to admit I am terrible at promoting my own fundraiser. I struggle with asking for help. This was really hard for me. Through the website we were blessed with $2,745! Then we had dear friends donate even more. Our total after church today was $4,115. We received a phone call on Saturday afternoon that we received another grant for $1,000. In one week we saw God provide us with over $5,115. It has nothing to do with us. God showed my unbelieving heart that He owns the cattle on a thousand hills. To be honest these have been extremely difficult few weeks. The final payments are coming due and we did not know how we would be able to make those payments and pay for our airfare. Our flights alone have totaled over $8,000. It is amazing for me to think that we leave soon! Please keep us in prayer as we take Rebecca and and travel to meet Hui Yi. Pray for our new daughter as we are certain she is scared. I have been wanting to dedicate a post about our Bringing Selah Home Give1 Save1 event but our week got super busy! Busy in a good way though. Sunday began our event for raising funds. We have been blessed so much in our journey to China. I will admit that I am terrible about promoting my own fundraiser. Honestly I would rather not. But we need to get Selah home . We have been so blessed by numerous sweet people. I can tell you that I am so honored that so many have been following our story. I have watched, as many who are financially struggling during this holiday, give to our adoption. We have had parents, siblings, aunts, uncles, cousins, missionaries, adoption friends, cyber friends, old high school friends, church family, friends of family, and complete strangers donate. Right now our funds raised stand at $2209.69! Isn't that amazing? I had no idea how we would do with this and I am so honored! We will allow the event to last until December 28th. However we will be featured for one week only on the Give1 Save1 blog. Jeremy and I celebrated our 18th wedding anniversary! I honestly love Jeremy more than I could have ever imagined possible. I adore him and he is perfect for me. 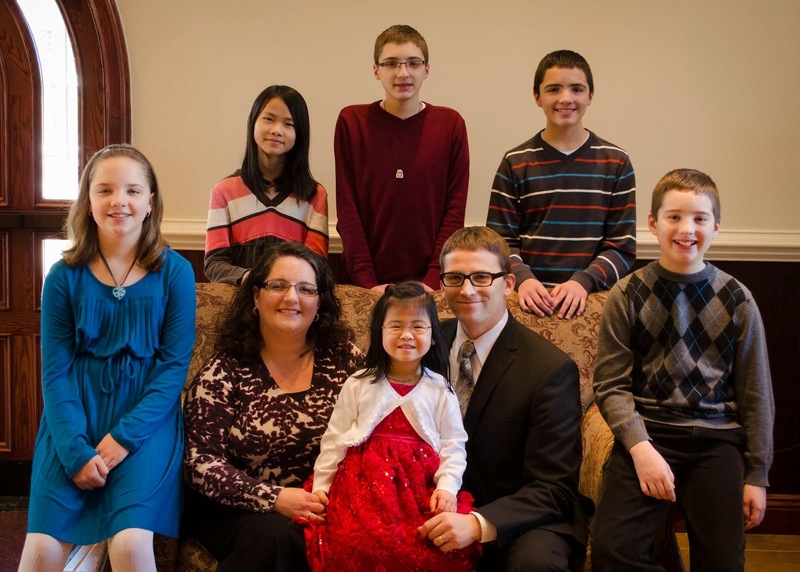 We never imagined we would be planning our second trip to China and six kids! Raising kids is the toughest job I've ever had. But the smiles and notes like this are so worth the exhaustion! This was card number 2 from Rebecca. Her other card was priceless, thoughtful, and selfless. I do not deserve this sweet child. She honestly would give us anything within her power. She shopped at the AWANA store just last night and bought something for everyone else in the house and got herself one small pair of earrings and could not have been happier. She is so special! Jeremy stopped and got these beautiful roses for me. It wouldn't be a happy anniversary post if I didn't share a photo from that very cold December day in Leechburg, Pennsylvania. Look how young we were when we married! Oh my!!! This photo was snapped by our photographer as we sat on the steps at the front of the church waiting for the rest of our family to gather for photos. We were both relieved the ceremony was over! Our hearts are overwhelmed with the outpouring of love on our family and for our sweet Selah! I cannot wait to meet her! This week our youngest son hit the double digits. He is a whopping 10 years old now. Oh Benjamin, you melt my heart. You keep me on my toes. I love your zeal for life. I cannot wait to see what God has in store for you. You definitely live life to the fullest. I love that you still like to cuddle. I love that you love others with all your heart. I love that you are a bundle of energy. I love that you are a Child of the King! Serve the Lord and honor Him. That is all we ever ask of our kids. We had family come in for the holiday. For the first time in many years we stayed home for Thanksgiving. My mom and dad came on Thursday and brought the entire dinner....turkey and all. Our plan was to enjoy Thursday and the men would work Friday then we would have our Thanksgiving meal that evening. My mom is the best cook I know. She made a delicious meal and Tammy and I helped just a little. Mom, I hope that I am half the cook that you are. Your six pies were delicious and the meal was equally good, as usual. Friday and Saturday the men-folk started working on building a closet for our older boys' bedroom. What a job! It gave us a few problems but we are well on our way to having it finished this coming week. After lunch on Saturday we had a small celebration for Ben. He was afraid that he would breathe and blow out the candles! Nothing like celebrating with a few cousins. We also have all of our decorating completed. I admit we scaled down a tad. We have a large tree in the living room and another in the family room. The kids have small trees up in their bedrooms and Jeremy put lights up outside. Some of the village pieces are out. I don't have a fancy tree. We have a ton of ornaments on this tree and the white lights that I prefer. I really do love this tree. This is one reason why we scaled down a tad....a toddler changes things. We sent a care package to Selah a few weeks ago. We wanted to send things that we thought she would enjoy yet were age appropriate. I think the hairbows are a bit too young for her but we allowed them to be sent regardless. We also sent money for a fruit basket to be sent to the foster family. Somehow I am missing the photo of the Barbie we sent. We sent a few newer photos of our family. The bunny to the far right is for the other foster child living in their home. Since she does not read or speak English we asked for some books for her to read that had good moral themes. I only can hope they are appropriate! Evidently the service that purchased the care package for Selah also asked the orphanage for photos. Last time we did not get any so we did not even ask. To our surprise this is what I found in my email this morning! Jeremy and I both think she will be very cold here. I better buy that electric blanket I've been debating about. There is not much to her. These were taken at the orphanage. I already bought her some lip balm for those dry lips. I am not certain what this photo is about but she has such a sweet face. We cannot wait to see a full smile on her beautiful face. I know she has come from very difficult circumstances. We ask that you pray for us as we meet her in just a few weeks. God is good! What a wonderful Christmas gift He had planned for us this year. 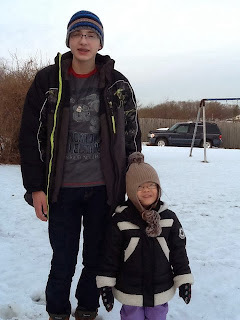 As I think back just two years ago when we were considering our first adoption, I remember telling Jeremy that there is no way I could adopt an older child. I am so glad that God opened my eyes to this beautiful opportunity to be Selah's mom. I know it will be unbelievably difficult. I do not feel qualified. And honestly, I'm not. I will lean on God even more. Selah will teach me more about myself, likely things I probably do not want to learn. We are called to this lot in life. It is ours and we proudly own it! God will equip us. This week we are trying to raise funds for our adoption. Keep checking back and I'll keep my blog updated as to the progress. Airfare is looking very expensive yet we have no choice. Jeremy made a beautiful video to share as well. The link should be up and running on Monday.